Tuning involves tightening and loosening the tension of the steel strings in a piano, so that they are organized to sound beautiful, or in harmony, together. The higher the tension of a string the higher the pitch of the sound, and conversely, the looser the string the lower the note of that string will be. Each string is attached to a steel tuning pin which is embedded into wood (pinblock). 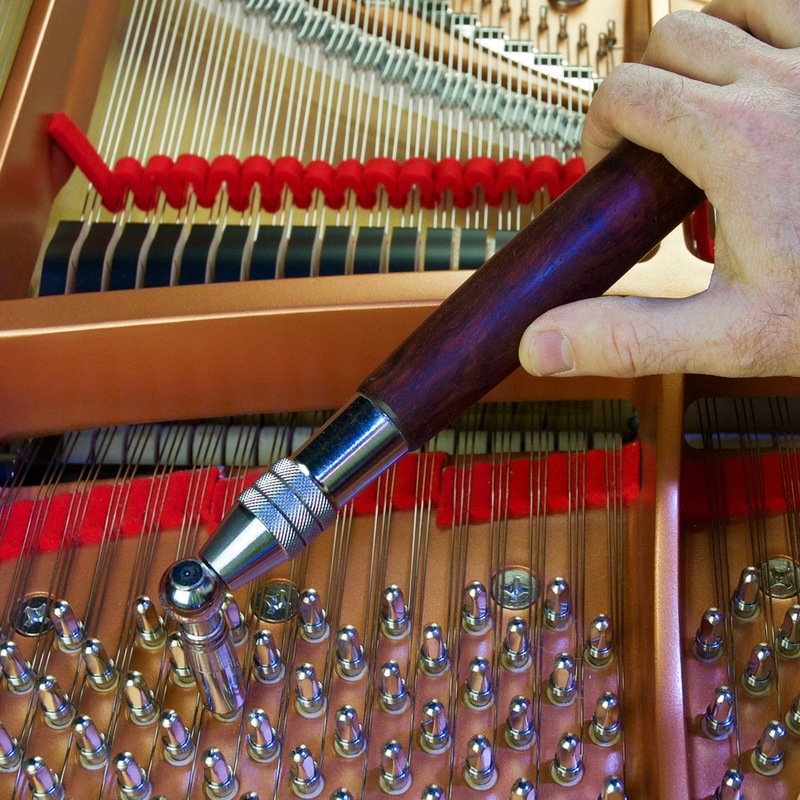 The piano tuner uses a tuning lever on these steel tuning pins to raise and lower the tension. The primary reason pianos go out of tune is due to fluctuations in the amount of moisture in the air; in other words - changes in humidity. Trees accept moisture and food from the ground along small tubes which contract and expand with the amount of moisture available to them. These tubes are what make up the growth rings, and later what we call the grain of the wood in sawn lumber. The moisture in the air still causes some expansion and contraction of the wood, even after the the wood has been cut and finished into a piano. Since about 80% of a piano is made out of wood, changes in humidity can sometimes have a large effect. If you've ever had difficulty opening a sticking door on a particularly damp day, you get the idea. When the heat in the house comes on in the winter, the air can be very dry and causes the wood in the piano, and hence the soundboard, to shrink a little. Since the strings are attached indirectly to the soundboard (via the bridge), as the wood shrinks the strings lose some tension and consequently the pitch of the piano drops. This is why a piano may go down in pitch, but still seem to be in tune with itself, without the pianist even knowing it. Too little humidity can also cause other problems over time such as loose tuning pins, which could render the piano untunable, irreparable cracks in the soundboard, and rattling keys. On the other hand, during the rainy season in the spring after the heat goes off the soundboard can swell up, cause extra tension on the strings, and the pitch of the piano will rise. Excessive humidity can also cause sticking keys and rusty strings. New pianos will tend to go out of tune faster than pianos that have been around for a while. This is because the strings are new and still stretching. If you've ever put a new string on a guitar, you know it takes a while for the new string to stop stretching and blend in with the old ones. This is why most piano manufacturers recommend at least four tunings in the first year. Playing the piano can have some effect on the tuning. The harder and more frequently the piano is played the more it will go out of tune, but overall humidity plays a much greater factor. Level pianos will stay in tune better than wobbly ones. Grand pianos have three legs and cannot wobble, but if you have a vertical you can make it stay in tune better by making sure all four casters are making solid contact with the floor. Drafts, direct heat and direct sunlight should be avoided as these will also affect the moisture content in the wood and cause unstable tuning. Moving a piano can flex the soundboard and cause a piano to go out of tune. Moving it to a different room, house or environment where there is a different humidity level can sometimes also causes changes, which is why a piano that has held its tune very well for many years, when moved to a less stable environment, may suddenly not hold a tune as well. Should a Piano That's Not Played Very Much Be Tuned as Often? Yes. This is one of the most common misconceptions. Playing has less to do with knocking the piano out of tune as does the humidity. The humidity keeps changing whether anyone is playing the piano or not. So the piano should be tuned whether anyone is playing it or not. Can the Piano Be Damaged by Not Having it Tuned? To keep a piano untuned for many years could do permanent damage to the piano. The strings are under a great deal of tension and tend to loose their tension over time. If the piano is kept untuned for too long you run the risk of the total pitch of the piano dropping. To bring the piano back to standard pitch may cause, at best, the necessity for several tunings over several weeks (at a higher cost) or, at worst, string breakage, and split bridges. Not only that, but playing on a poorly tuned piano can cause a potential musician to subconsciously not enjoy playing and hence, not wish to play. Many piano owners don't realize that not having a piano tuned regularly may also invalidate the warranty. That is why it is a good idea to keep the tuning receipts your technician gives you after each tuning, to prove that you've kept the piano maintained in case of a warranty claim.